Our cherry vanities are finished with a hand rubbed natural oil finish. 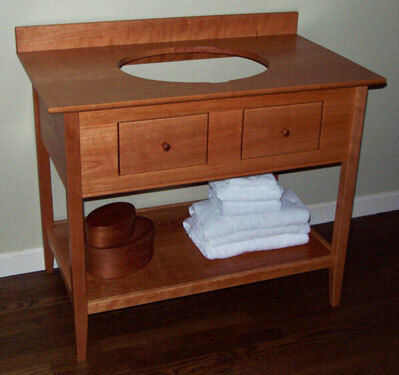 Our hard maple vanities are finished only with a clear finish. Our painted vanities are built from Poplar in your choice of 56 Milk paint colors. AND we also now offer 3,645 Benjamin Moore colors. 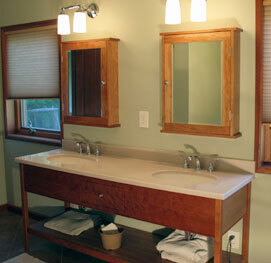 Our stained white oak vanities are finished in your choice of 9 beautiful stains. We also make matching medicine cabinets and mirrors!! 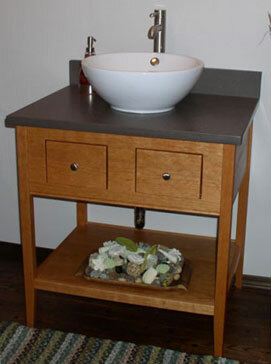 Check out our Double Height Apron Open Style Vanity on our Stained White Oak Vanity page. The cherry vanity in the top left photo is 72" wide, has 3 functional drawers with cherry knobs and also has a cherry top with custom 3 1/2" high backsplash. The matching custom mirror is 30" x 48" with a 2 3/4" frame. Other shaker mirrors can be seen here. The cherry vanity in the top right photo is 29" wide, has two functional drawers with satin nickel knobs, and a solid shelf. The top is made from a product called Earthcrete. 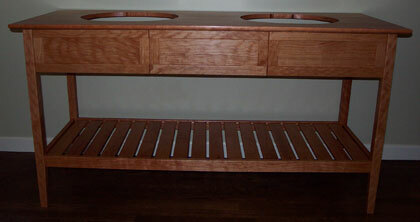 The photo to the left is also a 72" cherry vanity with one centered drawer and a manufactured top. The shelf is solid. 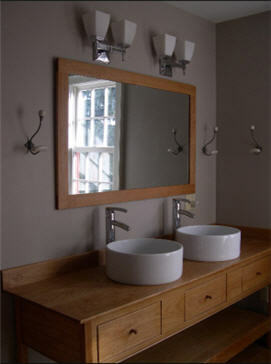 Slat shelves can be seen on our White Oak Vanity and Painted Vanity pages. 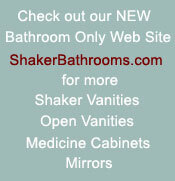 See Shaker medicine cabinets here. The prices below are only samples. We build everything to order so we can build your vanity the exact size and with the exact features you need. A 50% deposit is due at time of order with the balance plus shipping due when your item is ready to ship. - where you live (you may be able to get our vanities locally!) Here's Why! If you prefer, call 603-860-9377 and speak to a craftsman. Standard heights now range from 32" to 36" and depths range from 21" to 22 1/2" but if you need a different height and/or a different depth -- No problem and NO charge! Just let us know what you need; we will even design around your current plumbing for FREE.